There's very little information on how long time machine migrations are supposed to take on Google. 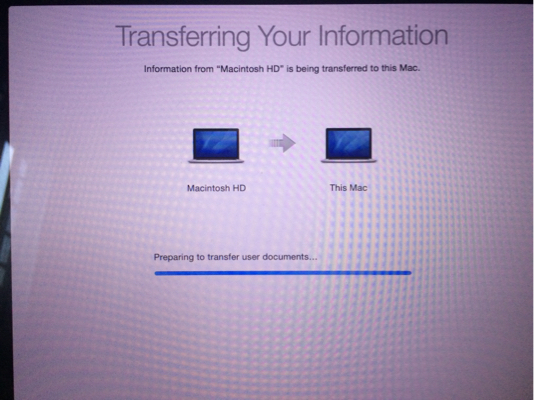 I have 200GB or so under my user and it has been stuck on "preparing to transfer user documents" for 14 hours. What's a normal time? Can I see the progress somehow without interrupting it? Should I just cancel it? It seems like it's because our time capsule is incredibly slow just generall, it takes 20 seconds - 1 minute to open a folder, "preparing" to copy a reasonable folder can take 10's of minutes. This is independently of me being plugged in directly to the time capsule or going over wireless. There doesn't seem to be a solution except possibly to do a factory reset, but first I'm going to get a 2TB disk and use the airport disk archiving function to save what I have. Not the answer you're looking for? Browse other questions tagged time-machine migration-assistant . Why does time machine backup take “3 days” over USB 3?